Tall and trim, with broad shoulders and a wide smile, Yitzy Hurwitz, a 42 year-old Chabad rabbi, was nursing big plans for his community in Temecula when he began having trouble speaking. It took months of tests to rule out other possibilities before a diagnosis of ALS was confirmed. Also known as Lou Gherig's disease, ALS is a progressive neurodegenerative disease that affects nerve cells in the brain and the spinal cord. Keeping positive in the face of his diagnosis is a test of faith, Yitzy said. "I have always taught others that everything G-d does is for the good although we don't always see it openly. So now, when this happened to me, I have to live with this same belief and deepen my faith, so that it is not just a matter of words." 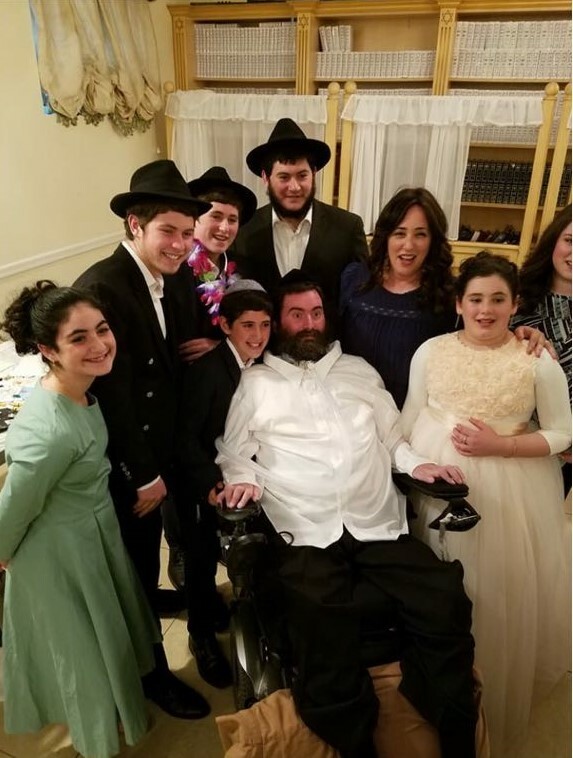 Rabbi Hurwitz the tzadik has been suffering with ALS for years. As in past years the family is treated to a much needed and deserved vacation to the KMR program in Henderson, NV. The challenge is to get Rabbi Hurwitz and his specialized wheelchair there. B"H the Werner family of KMR is sponsoring the family at their amazing Pesach program. We need to raise $25,000 to pay for a private medical transport to the hotel and back. What bigger zechus can we have then to help the Hurwitz family enjoy thier Chayrus for Pesach. All donations are tax deductible. Have a Kosher and Freilechen Pesach! Refuah Shleima- Chag kasher V'Sameach! Thank you Rabbi Yitzy and Dina for being such an inspiration! פסח כשר ושמח למשפחת הורביץ! I daven for you everday! with warmest wishes for a chag kasher v'sameach! לחרות אמיתית לגאולה בקרוב ממש!!! With prayers for the Have to be nisgale and ask sick people will be healed. I saw your story and it touched me and my daughter. May you see miracles Hag sameach to your family . Ah Kosher un Freilachen Pessach Yitzi&Dina and family! Contact Help Reb Yitzy spend Pesach with his family!